Quantic Dream’s Detroit: Become Human is an ambitious game with a strong story to tell. You’ll be hit with heavy moral questions such as: is slavery still bad if it’s branded and sold to you in a minimally designed vaguely futuristic shop? And do the ends justify the means, but with computers? As with other David Cage games, Detroit: Become Human focuses on story over gameplay, where the player can influence the narrative through dialogue choices and character actions, with a whopping great dose of quick time events thrown into the mix. What makes Detroit stand out is just how intricate it is; weaving the player’s choices together across three point of views, with an immense number of paths the story can take. Putting the player in control of three distinct android characters, the story is set in a future Detroit (surprising) with the fate of androids wishing to become human (extra surprising) taking centre stage. I’ll try and avoid particulars of the story to steer entirely clear of spoilers, and instead loosely speak of the themes involved and how you, the player, can influence the story. A sample of the narrative paths. Each character has a different perspective on the plight of androids discovering consciousness. 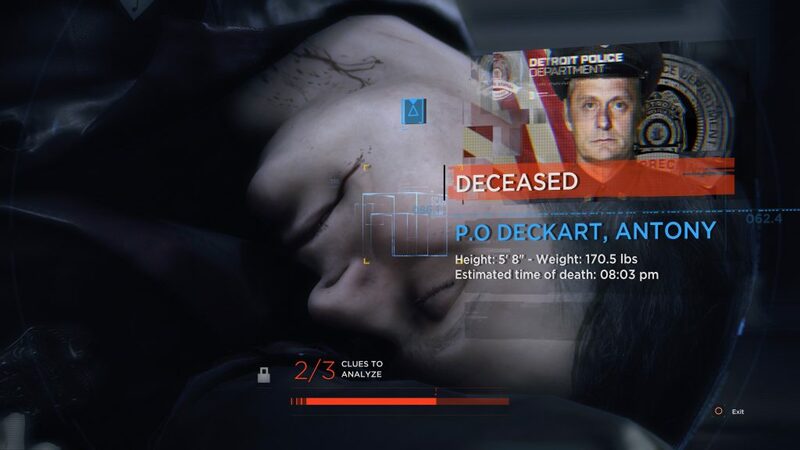 Connor works for CyberLife and is tasked with assisting the police to track down the “deviants,” which is the term for androids who come to life. Kara is a service android under an abusive owner who takes her fate into her own hands. And finally there’s Markus, who leads the android equality movement. Each character has an interesting story to tell, with the exception of the middle sections for Markus, which suffer in part due to his more linear path, which includes a few sections where you have very little impact on what happens. 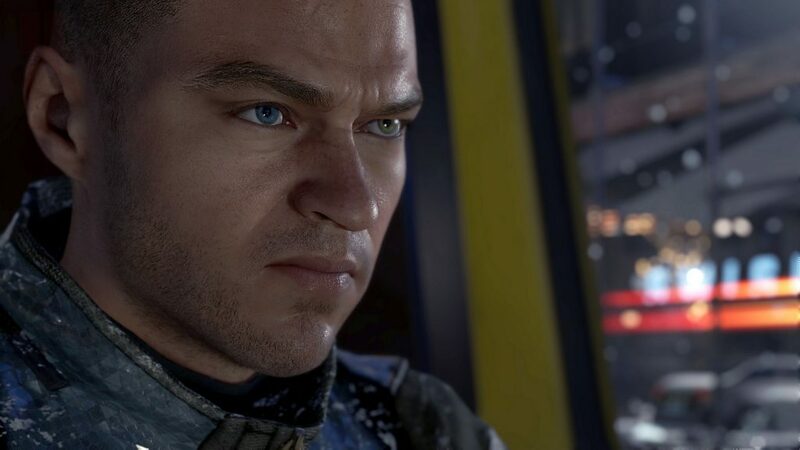 The reason I mention this is because the decision making is really what makes Detroit: Become Human for me, some of the split second decision you have to make stand out amongst the tougher choices I’ve ever had to make in a video game, and things become especially tense when there are lives on the line. Throughout the game almost all the characters can kick the bucket, which naturally alters the story in a pretty huge way. There are two main ways your characters can die, which is through either talking your way into the grave, or failing at a quick time event. Cause of death: didn’t smash that X button fast enough. ALSO LOOK AT THE COOL BLADE RUNNER REFERENCE. The speech based decision really had me transfixed on the game, with some extremely tense moments you have to talk yourself out of. When it comes to the quick time events, however, things are much more miss than hit. Mindlessly mashing buttons really doesn’t do it for me, and when it comes to the reaction based “hit X to not get dead” scenarios, I found them too jarring to be enjoyable. In more than one instance I was completely absorbed in the scene taking place and was surprised to see a QTE prompt intrude, leading me towards failure because it took me out of the moment. In a lot of instances I would have preferred the QTEs weren’t included at all. Even more so when you’re just completing tasks like pouring water by waving your controller around. Pouring a cup of coffee or scrubbing dishes did little to add to immersion, especially when the controller wasn’t registering the gyro movements the game wanted. In a lot of instances these moments detracted from the mostly powerful narrative. I say mostly because there are times where the story struggles to grasp the heavy themes around civil rights. Having a timed speech event based around which cliche slogan to chant at a rally was particularly eye rolling. Hitting a button to shout out “one world, two races” seemed to trivialize the whole message. Without going into too much detail, there was also one instance where I burst out laughing because it was so poorly done. It involved one possible event near the ending, and it relied on such an overplayed sci-fi trope it was hard to take seriously. We’re going back to original series Star Trek levels of corny. 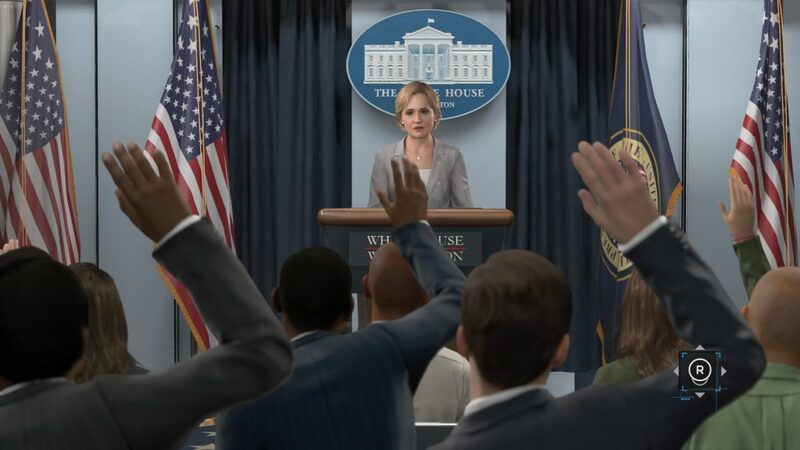 Whilst we’re on the eye rolling side of things, the game’s President is such a clear mash up of Hilary Clinton and Donald Trump that it was hard to take seriously, even when the events were tense. She’s a former celebrity with ties close to big business. President Hilranold Tumpton in action. Visually the game is strong, with the characters, setting and action pieces playing out flawlessly. The voice work is up there, with solid performances across the board and some familiar voice performers in the mix all doing fine work. 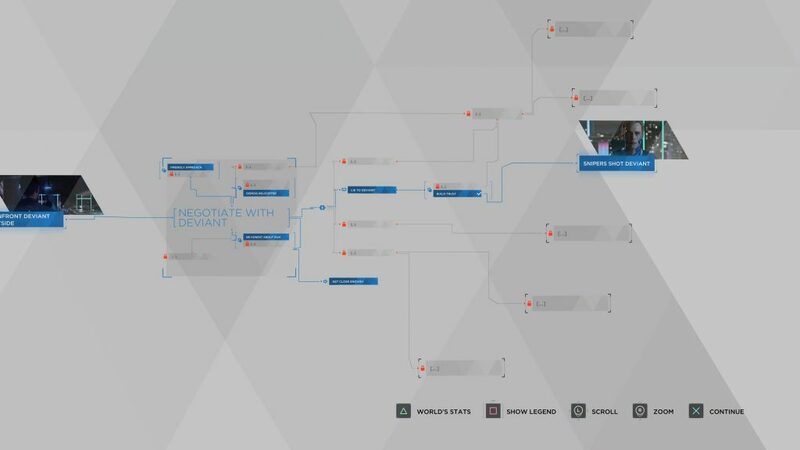 As for replayability, there’s a lot of variables in the timeline, which admittedly gave me extreme anxiety when I looked at the possibilities in the game. Some might feel inclined to explore them all, but personally I was happy with the ending I got, only going back to replay a handful of scenes when I was curious to see how key decisions would play out if I chose differently. Overall I thoroughly enjoyed my time in Detroit: Become Human, despite a couple of the issues I had with it. I wouldn’t hesitate to recommend it for those who like a story driven game and want to experience some of the tensest decisions you’ll have to make in a video game. Detroit: Become Human is a powerful game that stumbles on occasion. The whole package is worth experiencing, however it won’t be for those who dislike decision based games with passive gameplay, and if you're strongly against QTEs it's definitely not for you. Fans of sci-fi should enjoy the game's ambitious story and outstanding production quality. Send a blade runner after Charlie on Twitter @clbraith, and don’t forget to follow @load_screen and like us on Facebook.